Imagine this – it’s a sweltering summer day in Columbus. The humidity outside is high, hitting you like a wall when you open the door. So, the only place you want to be is on the couch with the cool air conditioned air being blown across your face. Sounds pretty good doesn’t it? Now, imagine what happens when that cool conditioned air stops flowing. A breakdown in your Columbus HVAC system is the absolute last thing you want to experience on a day where the mercury dings 90+ but it can happen, and the only way to ensure things don’t get out of hand is to take the following steps. Check Common Problems –While the system itself could be broken, make sure there are no other issues involved. Frequently, the electricity supply can be interrupted by a power surge or a tripped breaker. In both cases, you can usually get the system back online by yourself. However, you should call an electrician to inspect it as soon as possible. Does it Turn On – If the air conditioning system turns on and simply doesn’t provide enough cooling for your home, it is likely a problem in the unit. In this case, check other common problems. Clogged filters can severely reduce efficiency and if the system freezes over, it may stop providing enough cooling. Still Not Working? – If the system refuses to turn on and there are not clear problems that you can fix yourself, it’s time to call a professional. A professional Columbus AC contractor should be available almost any day of the week for emergency calls like this. Of course, in the middle of a heat wave or cold snap, it’s very likely that they may be booked up for a couple days. To avoid this happening, have routine maintenance done as often as recommended to avoid the possibility of being without cooling or heating indefinitely. 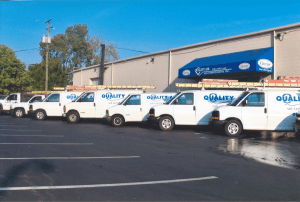 Call Quality Air Heating and Air Conditioning for any Columbus AC repairs you need!